There is no possible comparison between watching Real Madrid play on television, and live at the Santiago Bernabéu stadium,the atmosphere is electrifying, enjoy the experience! Tickets along the side of the pitch. This category include tickets in yellow sections: 109, 110, 125, 126, 209, 210, 225, 226, 309, 310, 311, 312, 325, 326, 327, 328, 409, 410, 411, 412, 433, 434, 435, 436, 501, 502, 503, 504, 505, 506, 507, 508, 509, 510, 511, 512, 535, 536, 537, 538, 539, 540, 541, 542, 543, 544, 635, 636, 637, 638, 639, 640, 641, 642, 643, 644, 645, 646. Tickets in Lateral, Upper level alongside of the pitch. This category include tickets in green sections: 601, 602, 603, 604, 605, 606, 607, 608, 609, 610, 701, 702, 703, 704, 705, 706, 707, 708, 709, 710. Tickets in Fondo, behind the goals. This category include tickets in red sections: 111, 112, 113, 114, 115, 116, 117, 118, 119, 120, 121, 122, 123, 124, 211, 212, 213, 214, 215, 216, 217, 218, 219, 220, 221, 222, 223, 224, 313, 314, 315, 316, 317, 318, 319, 320, 321, 322, 323, 324, 413, 414, 415, 416, 417, 418, 419, 420, 421, 422, 423, 424, 425, 426, 427, 428, 429, 430, 431, 432, 513, 514, 515, 516, 517, 518, 519, 520, 521, 522, 523, 524, 525, 526, 527, 528, 529, 530, 531, 532, 533, 534. Tickets in Fondo, the upper level behind the goals. This category include tickets in purple sections: 611, 612, 613, 614, 615, 616, 617, 618, 619, 620, 621, 622, 623, 624, 625, 626, 627, 628, 629, 630, 631, 632, 633, 634. The best seats in the stadium. Tickets in Lateral first and second tiers. 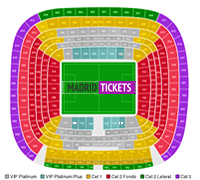 This category include tickets in grey sections: 105, 106, 107, 108, 127, 128, 129, 130, 200, 201, 202, 203, 204, 205, 206, 207, 208, 227, 228, 229, 230, 231, 232, 233, 234, 301, 302, 303, 304, 305, 306, 307, 308, 329, 330, 331, 332, 333, 334, 335, 336, 401, 402, 403, 404, 405, 406, 407, 408, 437, 438, 439, 440, 441, 442, 443, 444. The best seats in the stadium. Tickets in central Grada Lateral sections. 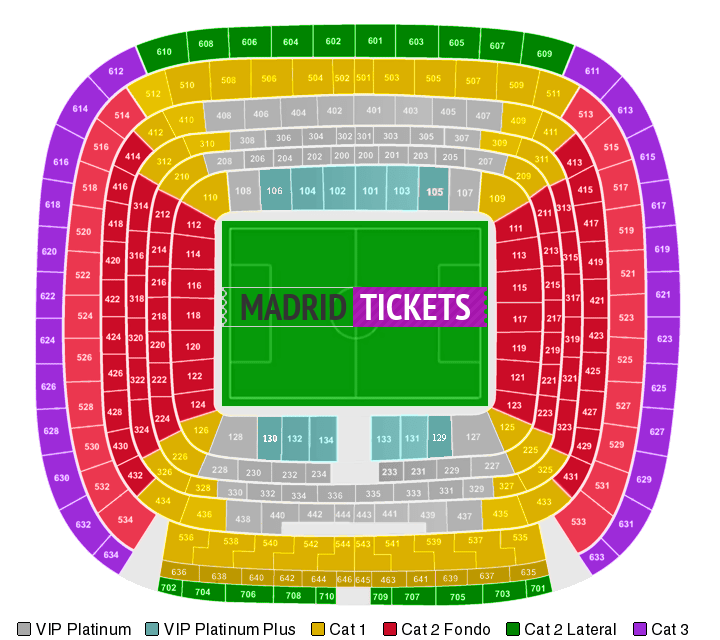 This category include tickets in blue sections: 101, 102, 103, 104, 134, 133, 132, 131. Car: The Santiago Bernabéu stadium is bordered by the following streets: The Paseo de la Castellana (West), Concha Espina (South), Padre Damián (East) and Rafael Salgado (North). The Paseo de la Castellana is one of the most important North-South arteries of Madrid. Open all year round except on the 25 December and 1 January. Tour access located at Tower B.
Monday to Saturday: 10:00 - 19:30. Sundays and holidays: 10:30 - 18:30. (For organizational purposes the route of the Tour and its schedule may vary. Visitors will be advised prior to acccessing the stadium). Tour visit: Panoramic view of the Stadium,Trophy room,walk around the pitch,presidential box,players tunnel,benches and coaching area,dressing rooms,press room,offical store. Tour open up to 5 hours prior to kick-off (no dressing room access).Two hours prior to kick-off only the Trophy Room is open to visitors. Tour visit: Trophy Room,panoramic view of the stadium from West Stand vantage point,official store.